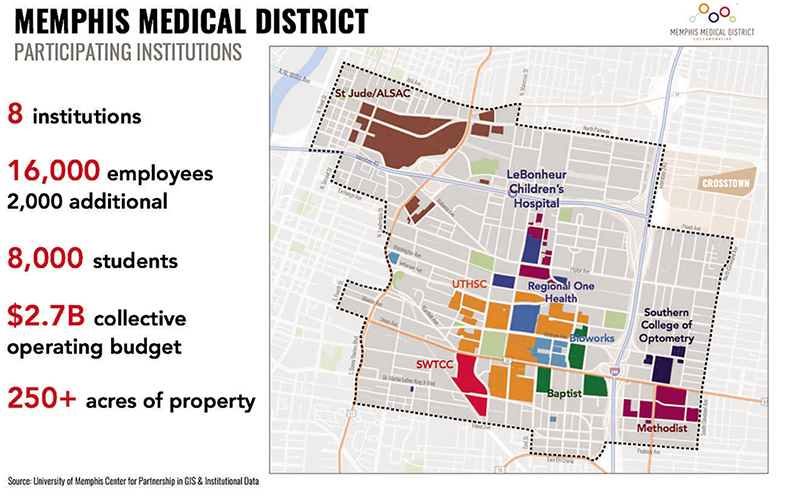 The Memphis Medical District Collaborative (MMDC) faces an imposing - seemingly impossible - challenge. The organization has been asked to take a portion of the city plagued by a perception of high crime, pockets of blight, a sizable number of vacant buildings, a lack of affordable housing, and a low supply of retail and commercial business and transform it into an area Memphis can be proud of and where people would enjoy working and living. The area is also a vital part of the city that includes two of the nation's finest children's hospitals, some of the state's most important healthcare providers and the University of Tennessee Health Science Center (UTHSC). Located between downtown and Midtown, the Memphis Medical District is roughly defined as the area bordered by Poplar Avenue, I-40, Vance Avenue and Danny Thomas Boulevard. The challenge not only is difficult, it is critical. And apparently the MMDC, a 501 c 3 non-profit community development organization, appears to be up to the task. With the assistance of eight local healthcare corporations, universities and colleges, the design has been made and a long-term growth plan drawn up that will dramatically change the area. When executed, the Medical District could be transformed by attracting new commercial, retail and residential development, by enhancing safety, improving community programming and landscape, and connecting area residents to jobs with the major employers in the area. 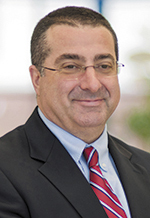 "We saw an opportunity with the Medical District," said Tommy Pacello, president of the MMDC. "It's a powerful area, but it's been seen as a 'drive-through area' in the city. We want to strengthen the communities in between the anchor institutions. There are billions of dollars being spent on renovating and expanding the medical institutions, and 24,000 people either work or go to school in the district. 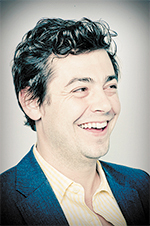 "We want to create a cohesive sense of place. Midtown and downtown have seen a renaissance of sorts over the last several years. It's time to invest in the infrastructure here. Our goal is to have people work, study, live and shop here. The collaborative is the vehicle to make that happen." According the Pacello, these institutions have a $2.7 billion collective operating budget and control 250 acres of property in the area. "It's the non-profit's job to leverage these institutions and connect the dots to involve the entire neighborhood and improve community and business development in the district," Pacello said. "The revitalization strategies wouldn't be possible without the collaborative efforts of these institutions." Last year, the collaborative focused its efforts on improving public common areas, streets and community programming. The MMDC hired 10 district ambassadors to clean street and park areas, improve seven intersections and clear 40 miles of weeds. Additionally, bike lanes were added and several art projects and street improvement projects were commissioned. "We wanted the area to look investment ready and for people to feel comfortable walking outside," Pacello said. The MMDC created regular community programming events for residents, employees and students in the area such as a concert in the park series and neighborhood bike ride events. The MMDC partnered with the Downtown Memphis Commission to create a series of slow ride bicycle events, called Freewheel, where participants bicycle through the Medical District and learn about the history of the area. According to Pacello, the collaborative is making strides this year in attracting new commercial and retail development to the district. Last year the MMDC issued a market study, which revealed there are 200,000 square feet of unused space and a low supply of non-medical-related businesses in the area. According the study, about 130,000 people pass through the area daily, and the district can sustain approximately 197,000 square feet of retail and restaurant development. The MMDC provides pre-development grants to entrepreneurs interested in starting businesses in the district. Entrepreneurs can receive up to $5,000 to turn an idea into a concept. An example is Edge Alley, at 600 Monroe Avenue, which houses a coffee shop and four micro-retailers. Edge Coffee Company and the retail incubator opened in July and was the first business with a pre-development grant. Additionally, $73 million is planned for redevelopment along Madison and Monroe avenues, which will feature a variety of residential, office, retail and green space. The plan is to renovate 150,000 square feet of existing structure, such as the former Wonder Bread bakery, vacant since 2012. Through its Live Local Medical District Program, the collaborative hopes to leverage what the institutions are spending by offering incentives - up to $2,000 for renters and $15,000 for homeowners - to encourage more people to move to the area. The collaborative has received 224 applicants for the program. "These are employees and students who work and go to school in the Medical District," Pacello said. Pacello says the MMDC is working with UTHSC and SCO to pursue housing ventures on their campuses, which could be leased to developers for apartments and residential use. Currently, these areas are parking lots and/or buildings that house operations that will be relocated. "There are 270 acres of surface that could be used for multi-use development, and 110 of them are owned by the anchor institutions in the area," Pacello said. "That is the size of harbor town. The institutions are looking into different scenarios to make parking more available also." Lewis Reich, OD, PhD, president of SCO, who is a member of the Board of Directors for the MMDC, says he can envision the college working with a developer on a ground/lease model that will give college officials some control of how the projects looks, yet make the housing available for anyone in the area. Currently, the college is considering a parking lot across from the school for development. He says the college will consider alternative parking solutions for the area first before seeking out a developer. "We want developers who will look at the development and see how it could benefit not only our students and faculty, but employees and students with Baptist College of Health Sciences, HealthSouth and Methodist as well," Reich said. The MMCD projects that there is potential for 2,000 to 2,600 new apartment units over the next five years. In terms of security for the area, the collaborative has coordinated with various on-campus police, including UTHSC, Southwest Tennessee Community College, SCO, the Memphis Police Department (MPD) and various private security firms to collect data about crime in the area and work on positioning cameras and lighting in the areas in between the medical institutions. Last September, the MMDC and various institutions sent representatives to Philadelphia to learn how the University of Pennsylvania's Department of Public Safety was able to improve public safety and security in West Philadelphia, an area that is similar in size to the Medical District. Today, security strategy for the Medical District is modeled after UPENN's model. 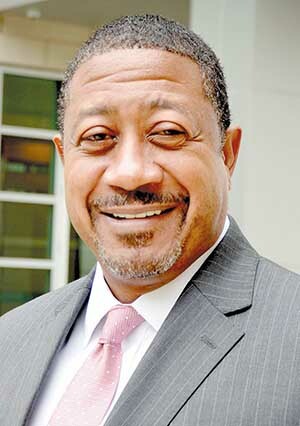 Ken Brown, PhD, executive vice chancellor and chief operations officer with UTHSC and chair of the board of directors for the MMDC, says the UTHSC campus police work closely with the Memphis police and are equipped to manage some external patrol in the Medical District. UTHSC received $8 million to $9 million in funding for several security projects, including an upgrade to its command center and additional external cameras. Currently, there are 300 external cameras on campus, which will increase to 1,200. "We are committed to the security of the campus and the Medical District," Brown said. "We are growing the size of our campus police and have the ability to function as a precinct of sorts and are able to provide the MPD some relief in the area." Additionally, the MMDC collaborated with all of the eight institutions in the district to connect human resource departments with local workforce development partners to connect residents to jobs at the institutions. The MMDC sees the potential for 5,000 additional jobs at the institutions during the next five years. "The overall plan isn't framed in terms of a designated timeline," Pacello said. "Different challenges evolve as different factors are put in place. This is a long-term endeavor, and we are only in one and a half years of the process. We have a great team and leadership in place to provide the support the institutions need to make the transformation happen."